I have learned about the e-jeepney in the news a few years ago. The concept and the implementation in Makati City were met by praise from quite a number of people. But I remember thinking to myself during that time that this e-jeepney idea is not really revolutionary. It was just putting an existing technology used in cars to a public transport vehicle which happens to be the jeepney. I had serious doubts about the e-jeepney’s viability to become a widespread alternative to the common jeepney that we find in the streets all over the Philippines. I was sure it was great for the environment because it had no carbon emission and it was partly a cure for the oil problem the world will have to face in the near future. In other words, I believed it was a good idea but not a great one. I believed it could help contribute in solving our energy and environment concerns but it could not possibly do a lot. I realized my ignorance only when I was able to watch the Discovery Science episode of Ecopolis which featured the e-jeepney. I saw it very recently while staying at a hotel in Malaysia. It was a replay of what was originally shown in January of 2009. In the episode, e-jeepney was hailed as the best among four competing options considered for which innovation had the best potential to address the increasing problem on climate change. Dr. Daniel Kammen, a Nobel Peace Prize winning professor and currently a climate advisor to the Obama administration, sent his letter of congratulations to the team who launched the e-jeepney in the Philippines. It is no wonder that in Ecopolis episode in which he was the judge, he declared the e-jeepney the winner for its potential to effectively lower carbon emissions worldwide by as much as 80%. However, 80% is quite a huge jump for carbon emission reduction to be achieved by replacing all the jeepneys with e-jeepneys. This potential will only be met if everyone in the entire world abandoned their cars and opted for public transportation using the e-jeepney. I highly doubt if that will ever happen. I think a more realistic aim is to phase out all internal combustion engines in favor of electric motors. This will take time but it’s not that far-fetched. I do not think people would be willing to let go of their cars that easily. They may not care too much about the engine as long as it delivers what they need but going for public transportation for everyone will take too much work and money it’s next to impossible. Today, there are 14 e-jeepneys plying the streets of Makati and a few in other parts of the country. The Institute for Climate and Sustainable Cities which owns and operates the e-jeepneys has just recently unveiled a battery swap program. This is aimed to address one of the concerns associated with battery powered engines. That is, it takes 8 hours to fully charge the battery versus a few minutes to fill up a gas tank for an ordinary gasoline-powered vehicle. With the battery swap program, the amount of time to replace the battery should be just as quick if not quicker than filling up for gas. The e-jeepney is not a complicated concept. It is made possible with the use of existing technologies. But it has the potential to change the transportation landscape not only for the Philippines but for the whole world if and when enough people have become convinced that there is a grave concern with our source of fossil fuel and the climate change crisis it engender. 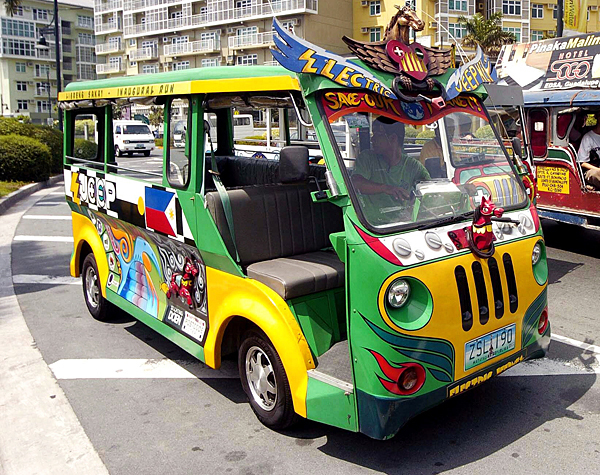 The e-jeepney may well be ahead of its time. I’m proud that the Philippines is its pioneer. I support and congratulate all those who are involved in this project. You deserve the credit. Good luck!